B-type natriuretic peptide molecular forms for risk stratification and prediction of outcome after acute myocardial infarction. BACKGROUND: B-type natriuretic peptide (BNP) is known to be a risk marker following acute myocardial infarction (MI). 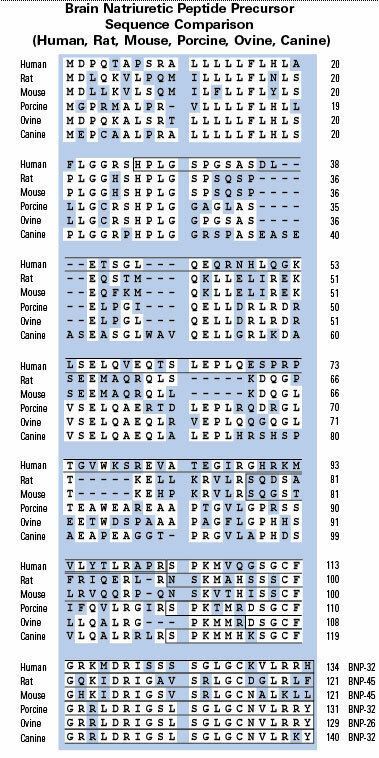 More recently, truncated molecular forms of the BNP molecule have been identified, with the association of these forms and outcome in acute MI not known. The present study investigated their use as risk stratifying biomarkers of this condition. METHODS: BNP molecular forms (BNP 5-32, BNP 4-32 and BNP 3-32) were measured in plasma from 1078 acute MI patients using immunocapture followed by MALDI-ToF-mass spectrometry. Associations of molecular forms with short-term and long-term adverse outcomes were assessed. RESULTS: BNP molecular forms were independent predictors of mortality/reinfarction, mortality/rehospitalization due to heart failure, and a composite of all events at 6 months, 1 year and 2 years and showed prognostic ability comparable with conventional BNP measurements (P<.001-0.026 vs. N-terminal [NT]-proBNP P<.001-0.020, respectively). Reclassification analyses showed BNP molecular forms successfully reclassified patient risk when used in addition to the GRACE clinical risk score (P≤.005). BNP 5-32 showed utility as a secondary risk stratification biomarker when used in combination with the GRACE score and NT-proBNP by successful down-classification of high-risk patients. CONCLUSIONS: BNP molecular forms were associated with poor prognosis at 6 months, 1 year and at 2 years in patients with acute MI. BNP 5-32 showed successful utility as a secondary marker in combination with NT-proBNP after GRACE scoring. This study suggests a potential role for BNP molecular forms in prognosis and risk stratification after acute MI. Israr MZ, Heaney LM, Ng LL, Suzuki T. B-type natriuretic peptide molecular forms for risk stratification and prediction of outcome after acute myocardial infarction. Am Heart J. 2018;200:37-43. Prognostic Role of Molecular Forms of B-Type Natriuretic Peptide in Acute Heart Failure. BACKGROUND: B-type natriuretic peptide (BNP) molecular forms 5-32, 4-32, and 3-32 are known to be present in the circulation of heart failure (HF) patients. This study investigated the prognostic role of circulating BNP molecular forms on risk prediction for patients with acute HF. METHODS: BNP molecular forms were measured in plasma using an immunocapture MALDI-TOF-mass spectrometry (MS) method. Associations of molecular BNP forms with adverse outcome of all-cause mortality (death) and a composite of all-cause mortality and rehospitalization due to HF (death/HF) at 6 months and 1 year were investigated. RESULTS: BNP molecular forms 5-32, 4-32, and 3-32 were detected in 838 out of 904 patient samples. BNP molecular forms were all able to independently predict death and death/HF at 6 months and 1 year. BNP 5-32 was the superior form with strongest predictive qualities for death at 6 months [adjusted hazard ratio (HR) 1.31, P = 0.005] and 1 year (adjusted HR 1.29, P = 0.002) and death/HF at 1 year (adjusted HR 1.18, P = 0.011). BNP 5-32, 4-32, and 3-32 showed decreased survival rates across increasing tertiles of circulating concentrations (P ≤ 0.004). BNP molecular forms showed prognostic ability comparable with conventional BNP measurements across all end points (P = 0.002-0.032 vs P = 0.014-0.039, respectively) and reduced associations with renal dysfunction (blood urea; Spearman correlation rs = 0.187-0.246 vs rs = 0.369, respectively). CONCLUSIONS: BNP molecular forms, notably BNP 5-32, showed association with poor prognosis at 6 months and 1 year in patients with acute HF. This is the first study reporting the prognostic ability of molecular BNP forms in HF patients and demonstrated comparable qualities to conventional BNP measurements. Suzuki T, Israr MZ, Heaney LM, Takaoka M, Squire IB, Ng LL. Prognostic Role of Molecular Forms of B-Type Natriuretic Peptide in Acute Heart Failure. Clin Chem. 2017;63(4):880-886. Comparison of mass spectrometry and clinical assay measurements of circulating fragments of B-type natriuretic peptide in patients with chronic heart failure. 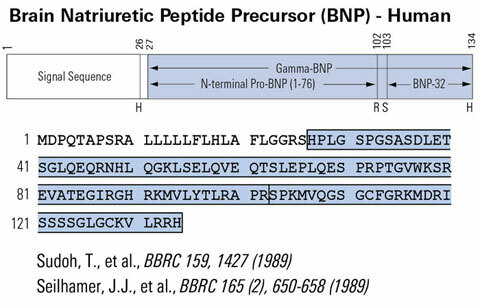 BACKGROUND: Multiple B-type natriuretic peptide (BNP) fragments circulate in patients with heart failure (HF) but the types and relative quantities, particularly in relation to bioactive BNP 1-32, remain poorly defined. The purpose of the study was to relate clinically available BNP values with quantitative information on the concentration of pre-secretion and post-processed fragments of BNP detected by massspectrometry. METHODS AND RESULTS: Seventy Class I-IV patients were prospectively enrolled with blood drawn into tubes containing a preservative to protect against BNP degradation. Samples were analyzed by quantitative mass spectrometry (MS) immunoassay for intact BNP 1-32 and its fragments. Clinical BNP 1-2 was measured by standard clinical laboratory methods. ProBNP 1-108, corin, and clinically measured BNP levels were elevated, but MS BNP 1-32 levels were low and differed from clinical BNP (P=0.01). Intact MS BNP 1-32 correlated modestly with clinical BNP (r=0.46, P<0.001). MS BNP fragments 3-32, 4-32, and 5-32 demonstrated the best associations with clinical BNP; fragment 5-32 with a correlation coefficient of r=0.81 (P<0.001). CONCLUSIONS: ProBNP 1-108 is measured by clinical BNP assays and contributes to the cumulative results of the BNP assay. However, the observation that clinically measured BNP correlates best with MS degradation fragments and relatively poorly with MS BNP 1-32 suggests that a significant component of circulating clinical BNP is composed of such fragments that are known to demonstrate little biological activity. 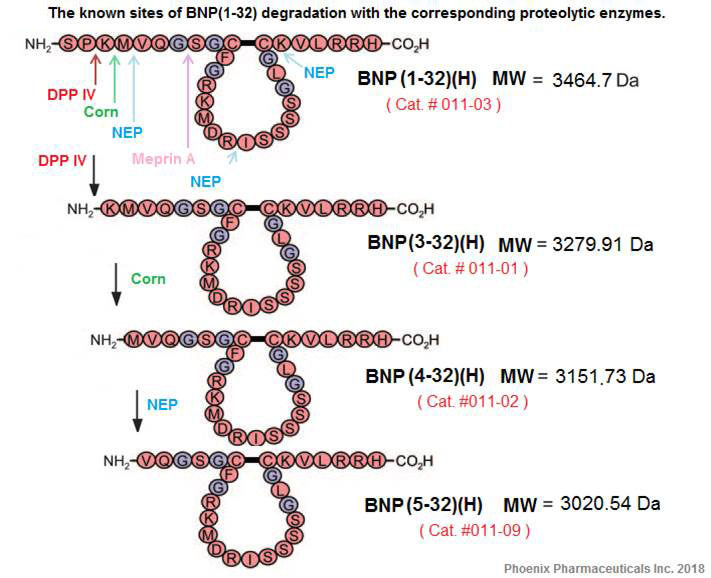 There appear to be multiple pathways involved in the dysregulation of proBNP in HF, and both the processing of proBNP and the downstream degradation to BNP 1-32 appear to be critical. Miller WL, Phelps MA, Wood CM, et al. Comparison of mass spectrometry and clinical assay measurements of circulating fragments of B-type natriuretic peptide in patients with chronic heart failure. Circ Heart Fail. 2011;4(3):355-60. B-type natriuretic peptide 8-32, which is produced from mature BNP 1-32 by the metalloproteasemeprin A, has reduced bioactivity. 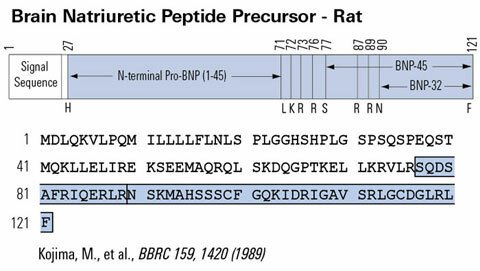 32-amino acid B-type natriuretic peptide (BNP 1-32) plays an important role in cardiovascular homeostasis. Recently, it was reported that BNP 1-32 is cleaved by the metalloprotease meprin A to BNP 8-32, the bioactivity of which is undefined. We hypothesized that BNP 8-32 has reduced vasodilating and natriuretic bioactivity compared with BNP 1-32 in vivo. Human BNP 8-32 and BNP 1-32 were compared in a crossover study in eight anesthetized normal canines. After a preinfusion clearance, BNP 1-32 was infused at 30 ng.kg(-1) x min(-1) for 45 min followed by a 60-min washout and a second preinfusion clearance. Then, equimolar BNP 8-32 was infused. In half of the studies, the peptide sequence was reversed. Changes with peptides from the respective preinfusion clearance to infusion clearance were compared with paired tests. Mean arterial pressure was reduced by both BNP 8-32 and BNP 1-32 (-8 +/- 3 vs. -6 +/- 2 mmHg, P = 0.48). Changes in right atrial pressure, pulmonary capillary wedge pressure, heart rate, cardiac output, and glomerular filtration rate were similar. However, urinary sodium excretion increased less with BNP 8-32 than with BNP 1-32 (+171 +/- 24 vs. +433 +/- 43 muEq/min; P = 0.008), as did urinary potassium excretion, urine flow, and renal blood flow. While BNP 8-32 has similar vasodilating actions as BNP 1-32, its diuretic and natriureticactions are reduced, suggesting a role for meprin A in the regulation of BNP 1-32 bioactivity in the kidney. Meprin A inhibition may be a potential strategy to increase the bioactivity of endogenous and exogenous BNP 1-32 in cardiovascular diseases. Boerrigter G, Costello-boerrigter LC, Harty GJ, et al. B-type natriuretic peptide 8-32, which is produced from mature BNP 1-32 by the metalloprotease meprin A, has reduced bioactivity. Am J Physiol Regul Integr Comp Physiol. 2009;296(6):R1744-50. NT-proBNP: a new diagnostic screening tool to differentiate between patients with normal and reduced left ventricular systolic function. OBJECTIVE: To evaluate whether measurements of N-terminal pro-brain natriuretic peptide (NT-proBNP) can be used to differentiate patients with normal and reduced left ventricular ejection fraction (LVEF) in an unselected consecutive group of hospital inpatients. SETTING: City general hospital, Copenhagen, Denmark. Patients and design: During a 10 month period 2230 admissions to a city general hospital (80% of targeted patients) had an echocardiographic evaluation of left ventricular function, a comprehensive clinical evaluation, and blood analysis of N-terminal-pro-brain natriuretic peptide (NT-proBNP) within 24 hours of admission. Exclusions resulted from lack of informed consent or failure to obtain the required evaluations before death or discharge from hospital. Echocardiography was unsatisfactory in 37 patients, so the final number studied was 2193. RESULTS: A raised NT-proBNP (>/= 357 pmol/l) identified patients with an LVEF of 40% was more than 97%. This probability rapidly decreased to 70% as the measured NT-proBNP increased to 150% of the predicted value. CONCLUSIONS: A single measurement of NT-proBNP at the time of hospital admission provides important information about LVEF in unselected patients. Bay M, Kirk V, Parner J, et al. NT-proBNP: a new diagnostic screening tool to differentiate between patients with normal and reduced left ventricular systolic function. Heart. 2003;89(2):150-4. Plasma catecholamines and N-terminal proBNP in patients with acute myocardial infarction undergoing primary angioplasty. Relation to left ventricular function and clinical outcome. BACKGROUND: Neither profiles nor prognostic values of neurohormonal markers have been prospectively evaluated in patients with acute myocardial infarction (AMI) undergoing primary angioplasty. METHODS AND RESULTS: In 118 consecutive patients with AMI undergoing successful reperfusion (TIMI 2 and 3) by primary angioplasty, plasma concentrations of norepinephrine, epinephrine and N-terminal proBNP (NT-proBNP) were measured before, 60 min and 10 days after angioplasty. Catecholamine concentrations (mean+/-SEM) rose to a maximum in the first hour after angioplasty (norepinephrine: 602+/-44ng/L, epinephrine: 213+/-24ng/L) and returned to normal at day 10. Conversely, NT-proBNP levels maintained a further increase from 799+/-44pmol/L at baseline to 924+/-54pmol/L at day 10. A NT-proBNP concentration above median at 60 min post-angioplasty predicted major adverse cardiac events (n=27) during the 18-36 month follow-up with an odds ratio of 5.9 (1.7-20.3) and was superior to catecholamines, to left ventricular ejection fraction and to other established postinfarction risk markers. CONCLUSIONS: In a low-risk cohort of patients with AMI undergoing successful reperfusion therapy, plasma NT-proBNP concentrations are elevated for at least ten days. The prognostic value of early plasma NT-proBNP should be further evaluated concerning its ability to facilitate risk stratification of infarct patients. Hartmann F, Kurowski V, Maghsoudi A, et al. Plasma catecholamines and N-terminal proBNP in patients with acute myocardial infarction undergoing primary angioplasty. Relation to left ventricular function and clinical outcome. Z Kardiol. 2003;92(1):73-81. N-terminal pro-B-type natriuretic peptide and long-term mortality in acute coronary syndromes. Background: B-type natriuretic peptide (BNP) is a predictor of short- and medium-term prognosis across the spectrum of acute coronary syndromes (ACS). The N-terminal fragment of the BNP prohormone, N-BNP, may be an even stronger prognostic marker. We assessed the relation between subacute plasma N-BNP levels and long-term, all-cause mortality in a large, contemporary cohort of patients with ACS. Methods and Results: Blood samples for N-BNP determination were obtained in the subacute phase in 204 patients with ST-elevation myocardial infarction (MI): 220 with non-ST segment elevation MI and 185 with unstable angina in the subacute phase. After a median follow-up of 51months, 86 patients (14%) had died. Median N-BNP levels were significantly lower in long-term survivors than in patients dying (442 versus 1306 pmol/L; P < 0.0001). The unadjusted risk ratio of patients with supramedian N-BNP levels was 3.9(95% confidence interval, 2.4 to 6.5). In a multivariate Coxregression model, N-BNP (risk ratio 2.1 [95% confidence interval,1.1 to 3.9]) added prognostic information above and beyond Killip class, patient age, and left ventricular ejection fraction. Adjustment for peak troponin T levels did not markedly alter the relation between N-BNP and mortality. In patients with no evidence of clinical heart failure, N-BNP remained a significant predictor of mortality after adjustment for age and ejection fraction (risk ratio, 2.4 [95% confidence interval, 1.1 to 5.4]). Conclusions: N-BNP is a powerful indicator of long-term mortality in patients with ACS and provides prognostic information above and beyond conventional risk markers. Omland T, Persson A, Ng L, et al. N-terminal pro-B-type natriuretic peptide and long-term mortality in acute coronary syndromes. Circulation. 2002;106(23):2913-8. Rapid bedside measurement of brain natriuretic peptide in patients with chronic heart failure. BACKGROUND: Brain natriuretic peptide (BNP) levels have been used to assess clinical status and predict prognosis of patients with chronic heart failure (CHF). However, BNP levels can only be measured in specialized laboratories which has hampered its use in daily clinical practice. We compared a new, rapid, BNP assay with a conventional BNP measurement and evaluated the applicability to current practice by comparing it with standard clinical parameters. METHODS: BNP levels were determined in 78 stable CHF patients and 20 controls. The severity of CHF was assessed by determination of New York Heart Association functional class (NYHA), left ventricular ejection fraction (LVEF) and peak oxygen consumption (peak VO(2)), and these parameters were compared to BNP levels. RESULTS: Overall, rapid BNP assessment was highly correlated with the conventional BNP assay (r=0.95, P < 0.0001). In the higher ranges (>200 pmol/l), however, correlation was less accurate, and tended to overestimate. BNP levels also strongly correlated with both NYHA class, LVEF and peak VO(2) (all P < 0.001). A cut-off value for BNP of 20 pmol/l yielded a sensitivity of 91% and a specificity of 92% to detect the presence of left ventricular systolic dysfunction. CONCLUSIONS: Rapid measurement of BNP levels is comparable to conventional BNP measurement and strongly correlated to clinical tests that are currently used to stratify CHF patients. Wider use of this method may yield a reduction of costly and time-consuming clinical tests and may reduce the medical burden of CHF. Tjeerdsma G, De boer RA, Boomsma F, Van den berg MP, Pinto YM, Van veldhuisen DJ. Rapid bedside measurement of brain natriuretic peptide in patients with chronic heart failure. Int J Cardiol. 2002;86(2-3):143-9. Comparative measurement of N-terminal pro-brain natriuretic peptide and brain natriuretic peptide in ambulatory patients with heart failure. It is not clear whether brain natriuretic peptide (BNP) or N-terminal proBNP (NT-proBNP) is superior as a diagnostic and prognostic indicator in cardiac diseases. Here, we compare the clinical correlations of both peptides in a population of 92 ambulatory patients with heart failure, using a well-established immunoradiometric assay (IRMA) for BNP and an automated electrochemiluminescence immunoassay for NT-proBNP. 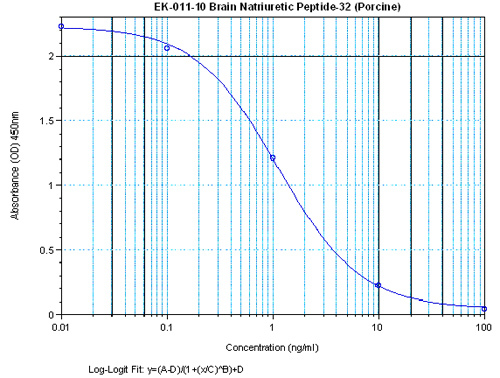 The analytical correlation between the two peptides was satisfactory over a wide range of concentrations (1-686 pM for BNP) with the equation: NT-proBNP = 3.48 x BNP -19 and a correlation coefficient r2=0.94. In addition, the concentration of both peptides increased in a similar fashion according to the severity of the disease New York Heart Association (NYHA) functional class, left ventricular ejection fraction, etiology) and age; for instance, the ratios between median levels measured in NYHA class III vs. class II patients were comparable for BNP (383 vs. 16 pM, ratio 24) and NT-proBNP (1306 vs. 57 pM, ratio 23). We conclude that N-terminal proBNP, as assayed in the present study, correlates equally to BNP with clinical variables in patients with heart failure. Masson S, Vago T, Baldi G, et al. Comparative measurement of N-terminal pro-brain natriuretic peptide and brain natriuretic peptide in ambulatory patients with heart failure. Clin Chem Lab Med. 2002;40(8):761-3. A rapid B-type natriuretic peptide assay accurately diagnoses left ventricular dysfunction and heart failure: a multicenter evaluation. BACKGROUND: B-Type natriuretic peptide (BNP), a protein released from the left ventricle in response to volume expansion and pressure overload, has emerged as the first whole blood marker for the identification of individuals with congestive heart failure (CHF). OBJECTIVE: The purpose of this study was to assess the performance of a point-of-care assay to diagnose and evaluate the severity of CHF on the basis of the New York Heart Association (NYHA) classification system. METHODS: Through a prospective, multicenter trial, whole blood samples were collected from a total of 1050 inpatients, outpatients, and healthy control patients. Participants were divided into subgroups for BNP analysis: patients without cardiovascular CHF (n = 473), patients with hypertension and no cardiovascular disease (n = 168), NYHA class I CHF (n = 73), class II CHF (n = 135), class III CHF (n = 141), and class IV CHF (n = 60). RESULTS: Circulating BNP concentrations determined from the bedside assay increased with CHF severity, as determined by the NYHA classification system, but were only statistically significant (P < .001) between individuals with and without CHF. Individuals without CHF had a median BNP concentration of 9.29 pg/mL. Median BNP values, with their corresponding interquartile ranges, for NYHA classification I through IV were 83.1 pg/mL (49.4-137 pg/mL), 235 pg/mL (137-391 pg/mL), 459 pg/mL (200-871 pg/mL), and 1119 pg/mL (728->1300 pg/mL), respectively. With the use of a decision threshold of 100 pg/mL, the assay demonstrated 82% sensitivity and 99% specificity for distinguishing control patients and patients with CHF. CONCLUSIONS: BNP concentrations obtained from whole blood samples are useful in the diagnosis of CHF and staging the severity of the disease. Wieczorek SJ, Wu AH, Christenson R, et al. A rapid B-type natriuretic peptide assay accurately diagnoses left ventricular dysfunction and heart failure: a multicenter evaluation. Am Heart J. 2002;144(5):834-9. Perioperative plasma concentrations of atrial and brain natriuretic peptides in patients undergoing hip arthroplasty. Acute hypotension, transient hypoxaemia and elevation of pulmonary artery pressure are well known to occur during cemented arthroplasty. The aim of this prospective clinical study was to characterize the relationship between plasma concentrations of atrial and brain natriuretic peptides (ANP, BNP), and changes in blood pressure in patients undergoing hip arthroplasty. Elevated ANP and BNP levels may be markers of inadequate myocardial reserve. We measured plasma ANP and BNP levels before the operation and 20 minutes after the cementing in 18 patients (54-90 yr). We defined a hypotensive response after cementing as a decrease in systolic blood pressure of more than 15 mm Hg below the pre-cementing value. In the hypotensive group, preoperative values of ANP were 123+/-48.5 pg/ml and BNP, 138+/-71.7 pg/ml. These values are significantly greater than those in the normotensive group (ANP 35.9+/-7.7, and BNP 17.2+/-3.2 pg/ml). High preoperative values of ANP and BNP are associated with more hypotension during cemented arthroplasty and could provide an indication of which patients are at risk of this complication. Terasako K. Perioperative plasma concentrations of atrial and brain natriuretic peptides in patients undergoing hip arthroplasty. Anaesth Intensive Care. 2002;30(5):588-90. A blood test that would aid in the diagnosis and management of patients with congestive heart failure would have a favorable impact on the staggering costs of the disease. 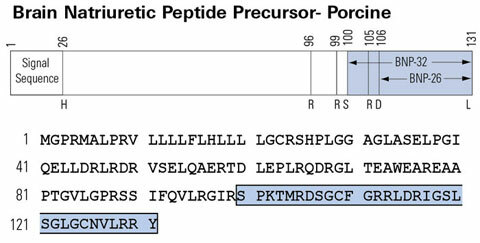 B-type naturetic peptide (BNP) is synthesized in the cardiac ventricles and its release is directly proportional to ventricular volume expansion and pressure overload. Levels of BNP correlate with left ventricular pressure, amount of dyspnea, and the state of neurohumoral modulation. BNP also correlates closely with New York Heart Association classification. A cut point of 100 pg/mL appears to discriminate patients with congestive heart failure from those without congestive heart failure. Measurement of BNP may also be an excellent screening tool for LV dysfunction. Maisel AS. B-type natriuretic peptide (BNP) levels: diagnostic and therapeutic potential. Rev Cardiovasc Med. 2001;2 Suppl 2:S13-8.